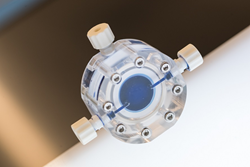 Draper’s microfluidic transduction device is designed to enable companies to manufacture T-cell therapies with half of the viral vector required by many current approaches. Draper's MTD device provides the control, precision and ability to scale to a higher throughput system that could potentially handle up to 1B cells,” said Jenna Balestrini of Draper. Immunotherapy has emerged as the hottest trend in cancer care by creating “living drugs” that are able to recognize and kill a patient’s cancer cells without damaging healthy cells. Making those therapies, however, is cumbersome, slow and expensive. For instance, the process for developing CAR T-cell therapies involves gathering T cells from the cancer patient’s blood, re-engineering them in a lab so they will recognize cancer cells as an “enemy” and then reintroducing these enriched T cells to the patient’s body. The current price tag for a single treatment: $450,000. The timeframe: 12-17 days. In addressing this challenge, engineers at Draper have developed a microfluidic transduction device (MTD) to enable companies to manufacture T-cell therapies with half of the viral vector required by many current approaches. One of the main factors driving the prohibitive expense of CAR T-cell therapies is the cost of the viral vector, which serves as the delivery vehicle of genomic materials into specific cells. Viral vectors, which can account for as much as 75 percent of a treatment’s cost, are themselves difficult and costly to manufacture. As a single device that accomplishes cell preparation and enrichment, Draper’s MTD can be integrated easily into existing lab automation systems for generating CAR T-cells. The MTD uses transmembrane fluid flow to both concentrate and co-localize target cells with viral vectors. Because this device increases the vector concentration in the vicinity of the cells, the result is greatly improved transduction efficiency. How much improvement? Draper scientists tested the platform and found they could achieve a twofold increase in viral transduction efficiency of human T-cells following a 90-minute transduction versus a 24-hour static control—meaning, MTD needed only half as much viral vector to reach the same transduction efficiency in comparison to current approaches. According to Jenna Balestrini, a program manager of cell bioprocessing and biomedical solutions at Draper, the MTD proved itself similarly effective in two additional areas valued by cell therapy companies: enhancing transduction in other primary human cells such as stem cells, and permitting the use of non-lentiviral vectors. “The technology provides the control, precision and ability to scale to a higher throughput system that could potentially handle up to 1B cells,” said Balestrini. 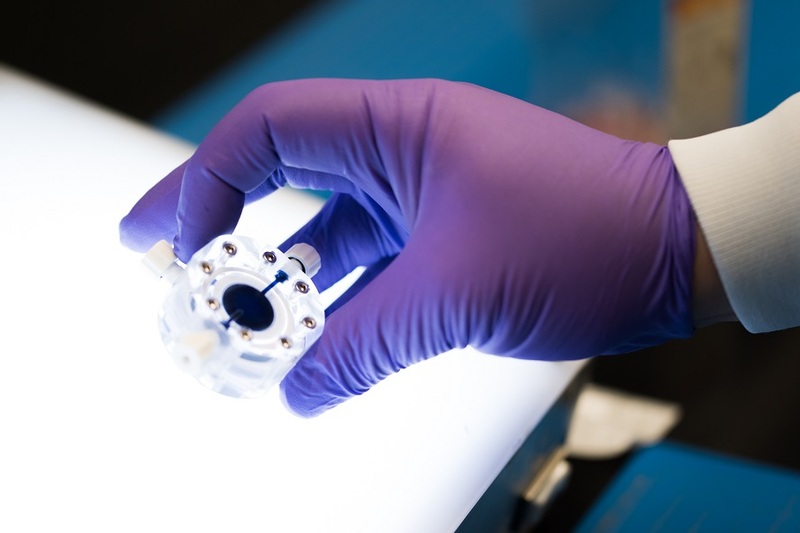 The microfluidic transduction device is part of an integrated portfolio of resources at Draper intended to help government, industry and academia make better use of biomedicine. The company is working with pharmaceutical companies on drug discovery and development; medical device developers to provide clinicians with quantitative diagnostic data at bedside to help them diagnose their patients’ illnesses more accurately and quickly; and biomanufacturing companies on increasing the speed and reducing the cost of processing cell therapies. Draper has developed a device for CAR T-cell therapy production that provides developers with a streamlined bioprocessing method designed to lower cost, improve efficiency and broaden patient access.